15 years ago, Food & Friends had no corporate or foundation funder of our newly established breast cancer services. The AVON Foundation took a chance on us and our new initiative. A $50,000 grant in 2001, which, 15 successive grants later, has now turned into a $4.3 million investment, 1.6 million meals, and over 2,000 lives changed. We are so glad that AVON’s support for our program has in more recent years been expanded to the Foundation’s support of similar programs in other major metropolitan areas. Many breast cancer survivors are women with children. Through our Pink Ribbon Delivery Service, funded by the AVON Foundation, we provide meals not only for the survivor, but also for household members– her partner, spouse, or children. This wicked illness devastates families as well as individuals, so we’re proud that we can provide for the family unit as a whole. 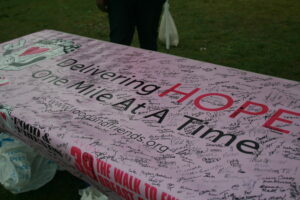 Food & Friends has partnered with the AVON Foundation for 15 years and for 13 AVON39 walks. This year I cheered the walkers in my drag cheerleader persona, Miss Ivanna Beat Breast Cancer. 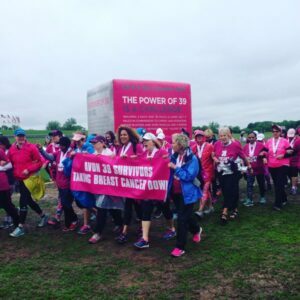 As the walkers trudged through rain and gloomy conditions, I reflected on the continued success of the AVON39. Many “thon” events have a life span that eventually leads to diminished interest, but with AVON39, there is a passion for this cause that sustains the event’s success. That’s not surprising because the incidence of breast cancer is undiminished. While the mortality rate from breast cancer, taken all together, has improved, people of color and of lower incomes fare far less well. And because the incidence remains high among all groups, there has been no turning away from this issue. And so two weekends ago we witnessed more than 2000 people raise a very large sum of money through their personal engagement. Given our strong partnership with the AVON Foundation, it’s important for Food & Friends to show our commitment to this event and play a unique role. In addition to providing our famous cookies and a delicious lunch for the walkers, Food & Friends fields a support team. In years when I’m not participating as a walker, I don my cheerleader attire and theatrical makeup to join in cheering on the walkers as a member of the support team. My participation in drag is the means by which I express my solidarity with these remarkable fundraisers and the women who face this terrible illness. (I’ll add that about one percent of breast cancer patients are men.) I certainly also understand the immediacy of this issue as a man with a wife and four children. Though my drag presence is amusing, I am deeply aware that there is no humor in this disease. Our world at Food & Friends is a world of gratitude. We have 9,000 volunteers and we’re grateful to them. We have thousands of donors, and we’re certainly grateful to them also. But among our funders, the AVON Foundation has a unique place in our history. The Foundation’s gifts include the $750,000 grant that built our kitchen, which not only serves people with breast cancer, but people with HIV/AIDS and other serious illnesses. This was AVON’s gift not only to our breast cancer survivors, but to every client who receives meals from the AVON Foundation kitchen. It’s a generous, inclusive gift and I’ll always be grateful to AVON because when no one else was there, they were. And not only that, they’ve remained there for 15 years. That’s a lot of friendship.